How would your electorate use $36 million per year? 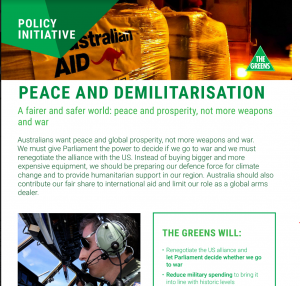 The federal government has announced plans to increase military spending. A temporary boost will be added: $200bn to the existing $30bn spent annually. (Australian Government Department of Defence, n.d.). 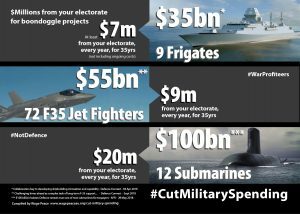 Three projects are presented here: 9 Ships, 72 Jets and 12 Submarines #CutMilitarySpending These are only 3 of… [Read more] #CutMilitarySpending – Speak up on three military mega-projects. 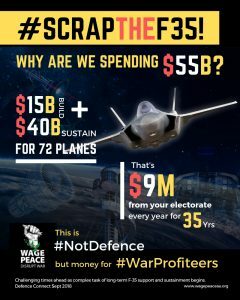 Letter to EOS Electro Optic Systems: Pause the Contracts with Saudi! To the CEO, Board-Members, Operational Management and workers of EOS, We will be gathering at your property at Hume tomorrow because we are extremely concerned that your company is selling EOS weapons systems into Saudi Arabia. 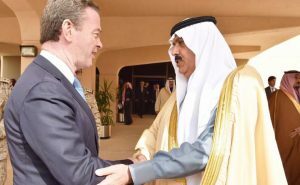 We are ordinary community members, calling ourselves Peace Pilgrims, but amongst us are people associated with the Women’s International… [Read more] Letter to EOS Electro Optic Systems: Pause the Contracts with Saudi! The mists of Avalon Air Show: Shrouded in lies! By Andy Paine The Asia Pacific region is undergoing major growth in defence and aviation, with budgets in many countries continuing to rise and an ever increasing level of sophistication in technologies, equipment, systems and operational methods. So goes the promotion from the Avalon International Aerospace and Defence Exposition, “the biggest aviation, aerospace and defence… [Read more] The mists of Avalon Air Show: Shrouded in lies!